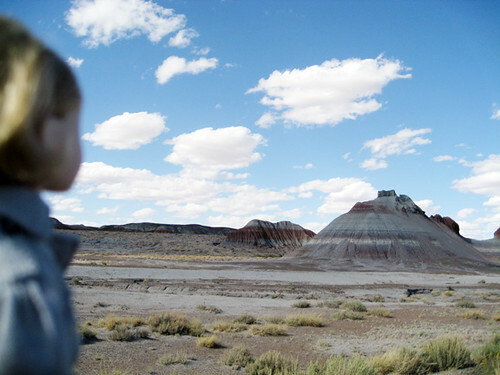 Oh, I almost forgot to include these photos, taken on the way home from New Mexico. 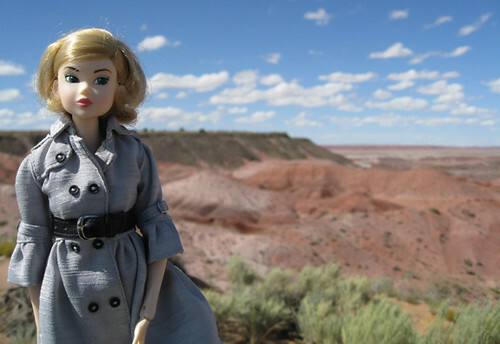 The Petrified Forest National Park is in Arizona. It's a large, rich, fascinating place. 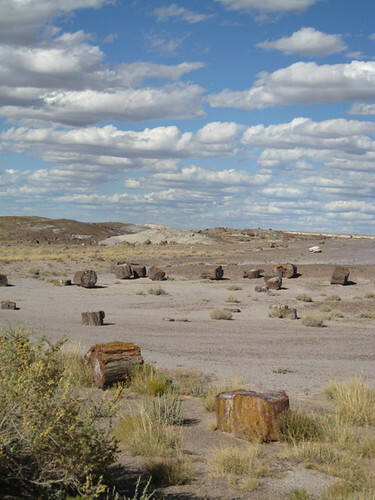 Unfortunately much of the petrified wood was stolen in past years. 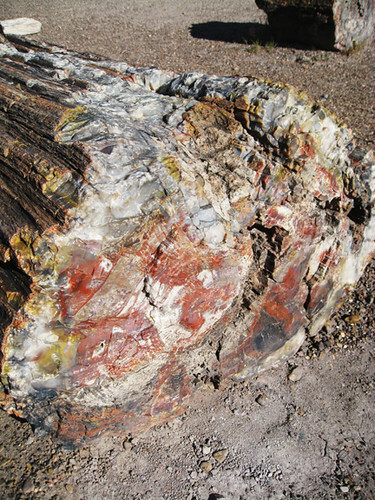 But you can still see petrified wood from the Triassic (225 million years ago) lying around. 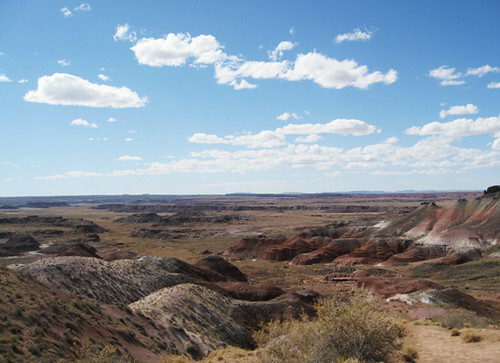 Very blue and red exposed hillsides, called the "Blue Tepees." 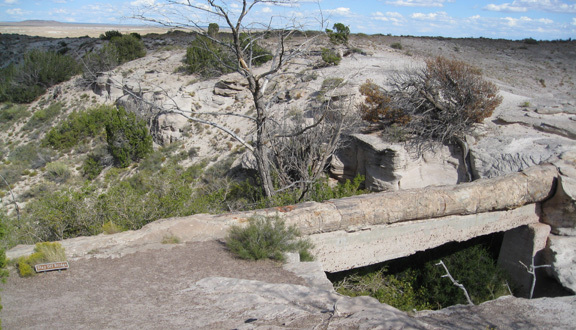 The Agate Bridge. It was reinforced with concrete in 1917, but yes, this is a whole petrified trunk (34m / 110 feet long), preserved from millions of years ago, that was found lying across the gully. 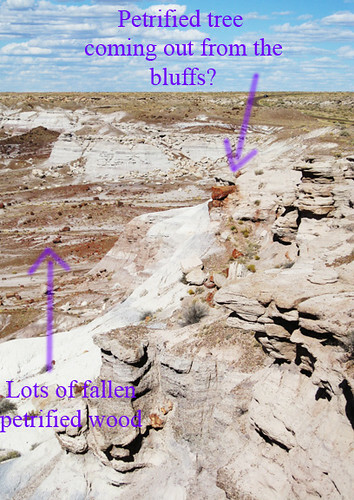 If you visit, don't take any petrified wood pieces. A number of people apparently mail back pieces to the National Park Service, and a lot of them say they had bad luck for taking them ! Anyway, you can buy lots petrified wood from the gift shops or other such shops nearly - which is from privately owned land (and hopefully no curse ). So, did you cross the Agate Bridge? It looks scary! Those Blue Tepees are cool. I like how you set it up so Gloria is looking at them, too. Interestingly, the sign actually says these days they wouldn't have reinforced the tree - if it falls apart, they will let it fall apart. I guess their new policy is to let things happen naturally. The area was really quite colorful! There was a cloud blocking the sun in that blue tepee shot, unfortunately. Wow that looks like a neat place to visit. 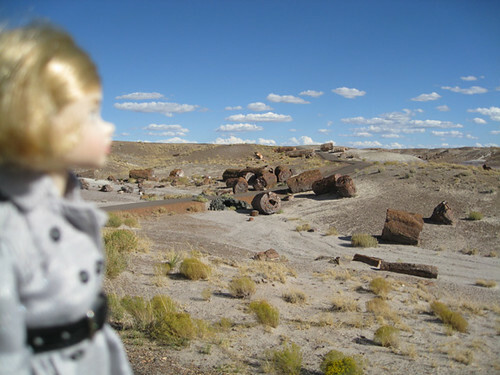 Wow, the petroglyphs look very cool, do they know what they say? 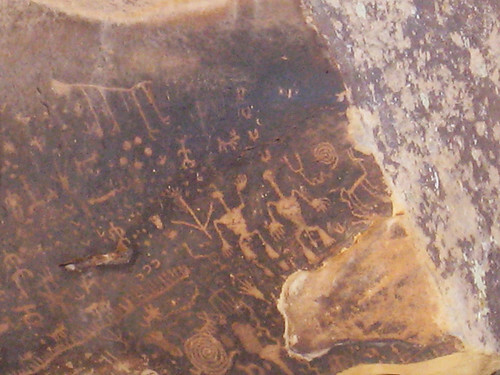 I wasn't sure, but according to this page, some petroglyphs (maybe not these) are solar calendars! That's definitely 1 place I gotta go check out next. You should! It's an awesome place. Seeing trees turned into agate is awesomely cool (cooler to me as an adult than when I was kid, ironically). 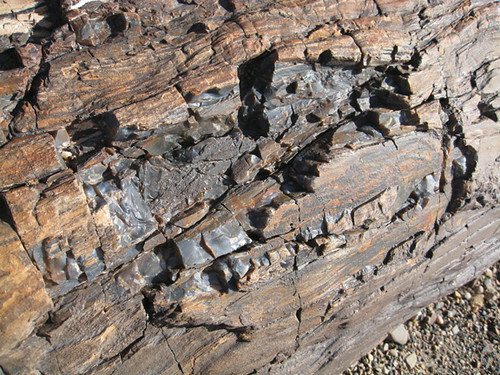 Petrified wood from the Triassic is so cool. I guess the reason that bad luck cursed in the wood must to prevent people from taking them. 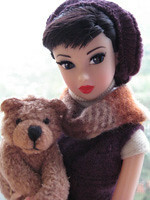 These are wonderful photos! I went there when I was much, much younger. I agree, it was a fascinating place! Some of the petrified wood looked exactly just like wood, with the grains still visible... others were crystal/quartz, shading into pinks and purples.